As a student I fell in love with technical drawing as perhaps you did. Later we learned AutoCad to draw on-screen. But it wasn’t the same. Your hands were tied to a mouse, tablet and keyboard while the drawing appeared on-screen. It was better than nothing but really nothing like drawing. Microsoft changed drawing back to a hands-on experience with the announcement of the Microsoft Surface Studio. It was a eureka moment, a moment when the game changed. You draw on the screen. Drawboard PDF shows how simple drawing has become with this new feature. Surface Studio one of the first computer products that makes touch a professional productivity solution. It’s a game-changer that doesn’t ask us to adapt to it. It adapts to us. Drawboard PDF is a PDF markup app for annotating drawings for the Architecture, Engineering and Construction industries. You can clearly see from the short video that marking up drawings is natural with the Surface Studio and Drawboard app. What could be more natural than drawing with a virtual protractor and floating T-square. The people at Drawboard immediately knew they could add the feature to their app. The Drawboard PDF update with the protractor will arrive in a few weeks, according to Drawboard. The Microsoft Surface Studio with Surface Dial is a runaway hit. Microsoft sold out the first consignment within days. You can pre-order now for delivery in early 2017. Surface Studio is not available outside the United States yet which is frustrating many potential buyers. I would have ordered one on release day if they shipped to Canada. With the Surface Studio we are going back to the natural way we learned how to draw – on the paper. Decades ago we gave up paper and drafting tables for onscreen drawing with programs like AutoCAD. Architects, draftspersons and designers had to re-learn their skills to draw with a pen disconnected visually and physically from the drawing surface. Over time various tablets, wheels and other devices were used to overcome the drawbacks to CAD. I always considered the computerized drawing solution a kludge, a poor imitation of the drawing table and real media. Microsoft has returned drawing to the natural hands-on experience it has been for centuries. 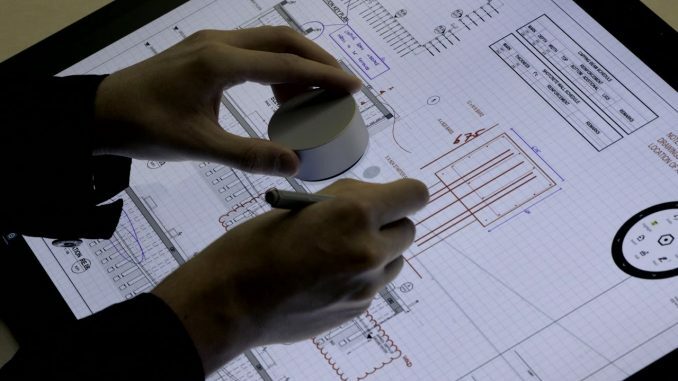 Drawboard wrote “Architects, engineers and construction professionals using the Surface Studio will be able to interact with detailed drawings and diagrams like never before with the pressure-sensitive Surface Pen on the Surface Studio’s large-format screen — turning their desk into a full studio experience,” says Drawboard. “This is exactly the kind of device that I have been waiting for as an engineer. It’s the perfect screen for viewing large, complex drawings and the experience with the pen is incredible,” said Alistair Michener, CEO/Founder, Drawboard. , a product that Apple could have built but didn’t. Unless Apple plays catch up in a hurry, they will lose their iMac graphics customers to the Surface Studio. Microsoft toughed it out converting Windows 7 from a mouse-and-keyboard driven operating system to a touch-based operating system. Through the iterations of Windows 8, 8.1 and Windows 10 we’ve seen steady progress until we now have a stable, powerful and capable touch based operating system. There will no doubt be other Surface Studio models from Microsoft in the future, and competitors. Microsoft has released a powerful and aspirational solution out of the gate in three configurations.
. Corporate licenses are available directly from Drawboard. There are three model options of the Surface Studio. If you want one, you should order soon for early 2017 delivery. I recommend the 2nd model which has the i7 processor, 16GB of ram and lots of power, except for a professional studio which needs the 32 GB and faster GPU. Like most all-in-one’s you can’t upgrade after the fact. The only caveat I see is that you can’t add internal adapter cards and more storage. However, there is plenty of connectivity with 4 USB 3 ports, a DisplayPort and SD card reader. Third Party developers will quickly adapt their devices to the Surface Studio’s standard technology platform. to use with the Surface Pro 4 or Surface Book. For detailed specifications see Surface Studio.